LEHNER: I started asking new questions. Not who built the Sphinx, and how were the pyramids built, but where are all the people? It seemed to me that 200 years of Egyptology had focused on pyramids, tombs and temples, and hieroglyphic inscriptions, and understandably so. Once you could read those things, my God, they were speaking to you in every tomb and temple wall. But if in fact as Herodotus said, there were 100,000 people—Herodotus the Greek, who wrote about 450 B.C.—if it took 100,000 people to build the great pyramid, I started thinking, having started to do some reading in anthropology, my God, that would be a super city in the third millennium B.C. Where is the city? How were they fed? How were they housed? Now Egyptologists have more sober estimates of some 20,000, 30,000, but even that would be a colossal city. So I started saying, well, we must be missing a whole component of the Giza Plateau, namely the people who built it, the evidence of their infrastructure. But it was the geology or the geomorphology, the shape of the landscape, that gave me the clues. NOVA: How did the geology of Giza give you evidence of a workforce that built the pyramids? 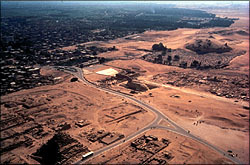 LEHNER: Basically the quarries tend to be to the south of the pyramids. And there you have a wadi or a valley that comes into the Giza Plateau from the Nile flood plain. So it seemed to me that that would be a good conduit for introducing all the non-local materials. They brought blocks of granite weighing 60 tons from Aswan 500 miles to the south. They brought enormous quantities of casing stone from across the river at Tura. Of course they brought in wood, they brought in gypsum, they brought in people, they brought in cattle for meat offerings, they brought in grain. I mean it must have been a huge Cecil B. DeMille kind of scenario when the pyramids were under construction. But if the quarries are to the south, the conduit for non-local materials was that valley or wadi, then the depression at the mouth of that wadi must have been the location of the harbor, which would have been substantial for unloading blocks of granite weighing 60 tons, for example. How did they do that? That's itself a mystery. But then I look out beyond that to the south and the southeast, and I said, you know, the infrastructure for the workforce must be out there. And lo and behold, right at the mouth of the wadi is this colossal stone wall, that in Arabic is called Wall of the Crow. It's never really been adequately explained. Why is it there? If it were anywhere here in the United States they would build a national park around it. But out there it's dwarfed by the pyramids, and yet it's two football fields in length, this stone wall, made out of blocks of stone as big as those in some of the pyramids and temples. Well, we started our excavations to the south with the hypothesis that that's where the workman's infrastructure is, because it's beyond the quarry, beyond the delivery area, beyond the workyard. 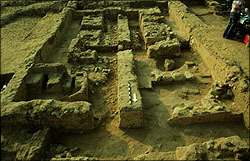 Now we've opened three places in the desert, and we found very interesting remains that probably relate to the infrastructure behind the pyramids. But we have not found, so far, housing for workmen. One of the places we opened, we found these two bakeries. NOVA: How did you know exactly where to begin digging? LEHNER: The reason we opened, peeled back the sand in this particular place, is because a backhoe had come, a mechanized backhoe, and gouged a huge hole in the desert, and we saw it cut right through ancient walls. Pottery from the time of the pyramids was just spilling out of the section left by this backhoe. So we cleaned up the area around this trench and we found walls running in all directions, well laid out to the cardinal directions running north, south, east, west, and forming rooms. Well, two of those rooms happened to be side by side bakeries, where they baked bread in these large bell-shaped pots. 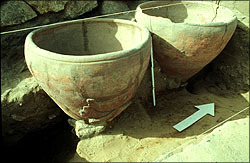 NOVA: How do you know the bell-shaped pots were used for baking bread? LEHNER: We knew that these were bread pots from way back when, because they're shown in tomb scenes being used for baking bread, in a very peculiar way, where they stack them up over an open fire, apparently to pre-heat them. Then they put them in the ground and they pour in the dough. And you know, that's the marvelous thing about Egyptian tombs, speaking somewhat flippantly, it's almost like a Sears Roebuck catalog. They actually show all the steps of baking with these bread pots. And they say, stack heating the pots, the little hieroglyphs, pouring the dough, adding the leaven, emptying the pots. And that's the marvelous thing about doing Egyptian archaeology. So it was a wonderful find. And it really forced us to look at these two small rooms, which are about the size of a good walk-in closet, in great detail. NOVA: What do the bakeries tell you about ancient Egypt? LEHNER: In 1995, we went back and said, 'OK, wait a minute. We've got two bakeries.' Bakeries don't exist in isolation like Wonder Bread factories in ancient Egypt you see. 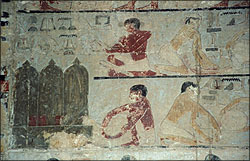 We're starting to know more and more in Egyptology and Egyptian archaeology that the economy and society of ancient Egypt was household based. You have large bakeries, and other kinds of industries, breweries, woodworking shops, sandalmaking shops, weaving shops, attached to large houses in a kind of modular fashion. They don't have factories with household alienated labor to the extent that we do. So we started wondering, to what are they attached? We had just the southeast corner of a huge mud brick building. And the backhoe had just gouged right through this corner, missing the bakeries. So we said, well, what's inside that building? So when we opened just a few small squares in 1995, limited because we were doing the radio carbon dating study at the same time, but in these squares we found these very peculiar long benches and troughs. And it looked like architecture for munchkins, because it's only as high as your ankles. 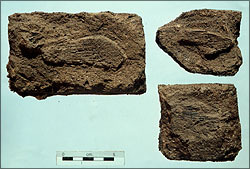 And all made in Nile valley floor mud, but then paved with desert clay to make it somewhat cleaner and more sterile. And we couldn't figure out what they were. Finally in the last few days of the dig, it always happens that way, we're just taking away with Swiss Army knives and very fine spatulas, the last few millimeters of deposit on the floor, which is rather ashy, and we found these fibrous elements. The men were saying, it's the top of a wheat stalk or barley grain, they were saying that it was grain. But the fibers turned out to be the gills and fins of fish. And then we found other parts, cranial parts and so on. So we think perhaps they were processing fish here. And given the systematic appearance of these troughs and benches, which seemed to extend considerably beyond our excavation, it looks like they were doing fish processing in great quantities. 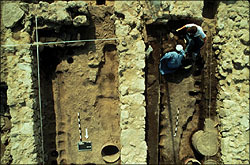 NOVA: What do you expect to find during your excavation this year? LEHNER: Well, in retrospect what we have are loaves and fishes, perhaps for feeding the masses at the pyramids. 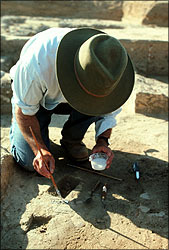 But as we go back in the next season we've now asked even bigger questions about the context of these finds.